1. Preheat the oven to 200ºC, gas mark 6. Cut the onions into chunks and arrange in a roasting tin. Set the beef joint on top, season and scatter with the thyme. Place in the oven for 20 minutes. 2. Meanwhile, parboil the parsnips for 5 minutes until partly softened. Drain well. Mix together the oil and mustard and toss with the parsnips. 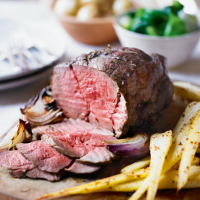 Arrange round the beef and return to the oven for 30-45 minutes, depending on how you like your beef. Turn the parsnips halfway through cooking. 3. Remove the beef from the oven and leave to rest in a warm place for 10 minutes. Slice and serve with the parsnips. This recipe was first published in Wed Sep 04 08:55:00 BST 2013.